Heraclitus said over 2000 years ago that “change is the only constant in life.” By now we all are becoming aware that change is the new normal. And still, most people naturally resist change. Even a natural cycle like leaping from one year into another is often experienced as an edge to cross. Just look around you this time of year. A lot is going on to prepare for this transition: from preparing rituals and celebration; to buying presents; to being busy and stressed. © Crossing the edge by Katelijne Vercaeren, 2018. It’s not just a countdown. It’s also a collection of behaviours and emotions. And depending on the context, every person has a different response style to crossing edges. Working with the behavioural aspects of change can be more challenging than dealing with the more process-driven aspects. So, let’s have a closer look at what your style, and the style of the people around you, is when preparing to cross the edge to the new year. With thanks to CRR Global for this unique way of looking at response styles to change. Leaper: you can’t wait and are ready to jump into the excitement of new things to come. You’re ready to get the party started — whether it is on Times Square, in Bali, or on an adventurous trip in the jungle somewhere! Bridge builder: you are taking a more cautious stance, waiting to find out what’s happening and considering the invitations coming your way. You are researching menus and places to go for a new year celebration. You are reviewing possible gifts online as you want to make sure everybody will be happy. Tradition holder: you love your traditions, the songs, fireworks and the way it has been celebrated by the generations before you. You care about traditional values and secretly wish everything can stay this way. You probably recognise yourself –or parts of yourself— in one of those scenarios, and they each have their value. In fact, each role is necessary and provides valuable information on how people respond in the face of change and how to get the best out of each response style. It is essential to have all styles understand and appreciate the challenges and strengths of the other. 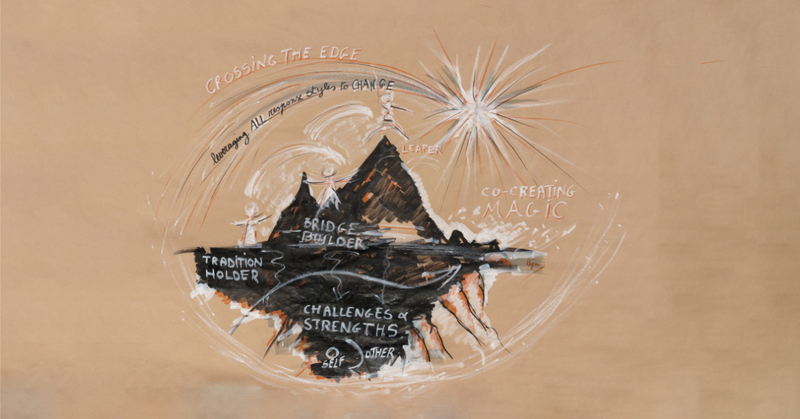 In essence, what matters is how to create magic together and help each other cross the edge into the new year, leveraging all the response styles to change! As the edge is approaching at a rapid pace, think about how a little awareness can help each other have a magical festive season, in style. Note: If you are curious about how we can help you explore response styles to change in the new year, get in touch or visit our website to learn more. An Art Historian in a previous life, today Katelijne is a communications pro and executive coach. She aspires to align leaders with their authentic purpose to live a creative life. She is a strong advocate of putting relationships first multiplying face-to-face interactions in a volatile world.